It started out with a duel between friends. 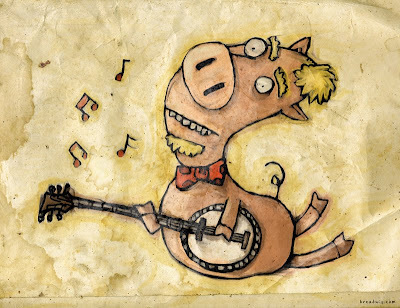 Guy Francis challenged fellow illustrator, Stacy Curtis, to a duel of banjo playing pigs. Now, other illustrators have joined the fun with banjo pigs of their own! We have more than 700 banjo pigs from countries all over the world! Have you created a banjo-playing pig you'd like to contribute? Everyone is invited to join the duel! E-mail it to Stacy or Guy and we'll post it on the blog, along with a link to your site or blog. Use this button to link to us from your website or blog! All content on the Dueling Banjo Pigs blog is copyright the respective artists. Don't force us to make you squeal like a pig. Shop at our General Store!